Who says a great golf promotion needs to take place at a golf course? Certainly not Mitch Lamborn with Tee Time Golf Complex. 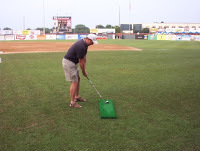 To bring added attention to his business, he teamed up with the Evansville Otters and gave randomly selected fans a chance to win $10,000 if they could make a “hole in one” in the outfield. 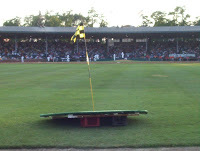 Pinch Putter Holes Shot in Shoot to Win ContestThinking About Running A Putting Contest?